Rings are a fun way to add some pizzazz to any outfit, but there’s no need to break the bank by buying a ring at the jewelry store – why not make your own instead? 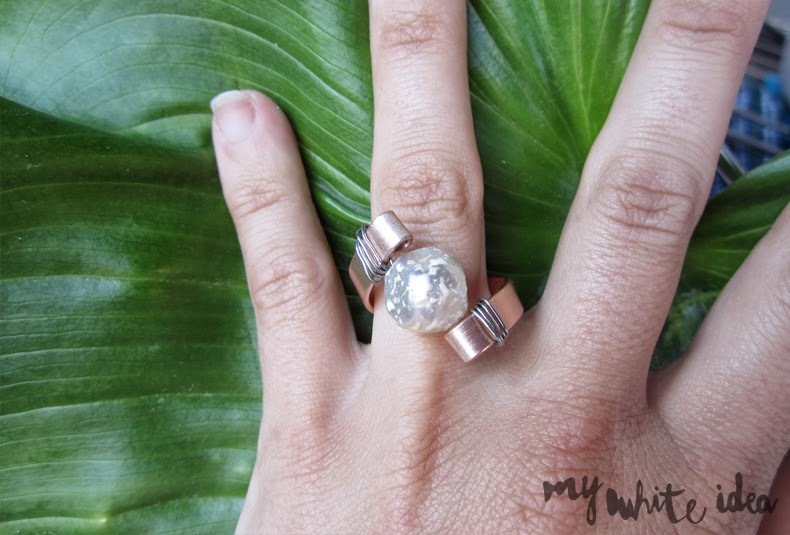 Here are 25 of our very favorite DIY rings that we’ve collected from around the internet. 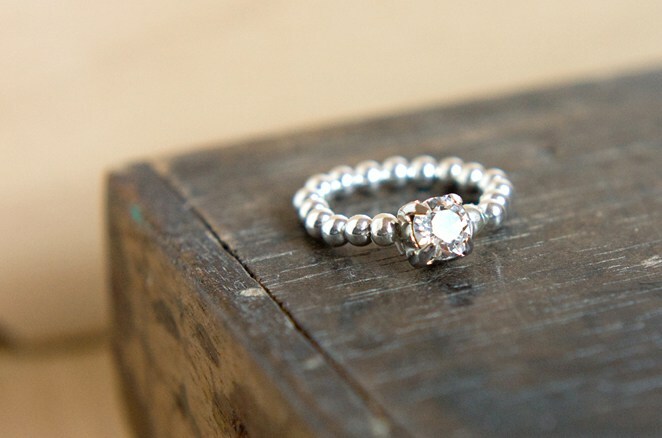 This understated ring has a beautiful, minimalist look to it – and it’s incredibly simple to make! Just grab some gold chain, wire and a few beads to get started… and you’ll be done in a jiffy. Make your way over to Nearly Crafty to check out the full photo tutorial. 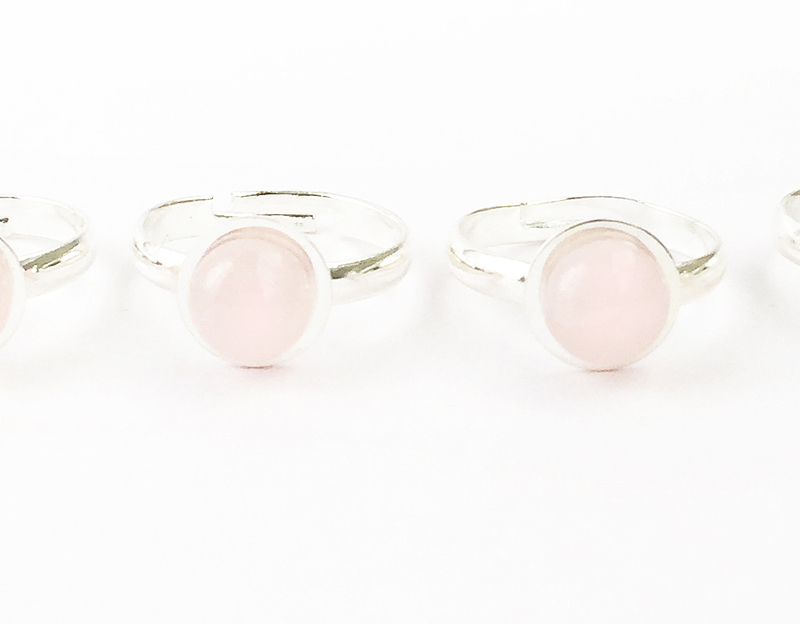 Here we have a set of beautiful quartz rings that are deceptively easy to make. 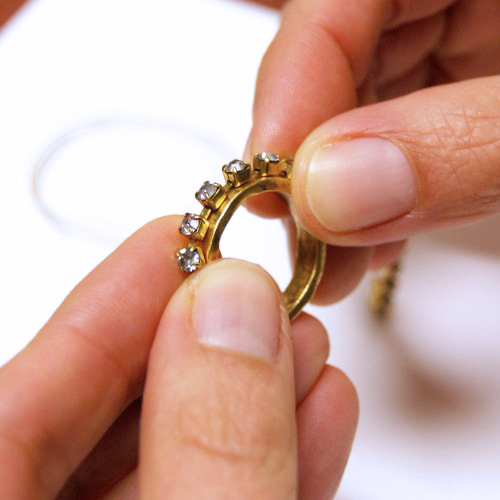 The key is to find what are called “ring blanks,” which are basically the metal part of the ring without the stone. Head on over to The Effortless Chic to find out all about it. These geometric beauties are made with seed beads, string and a needle. They are formed by creating an intricate yet easy-to-achieve woven pattern. And you can make any pattern that you like by using different bead colors. Get the instructions over at Gloria Fort. 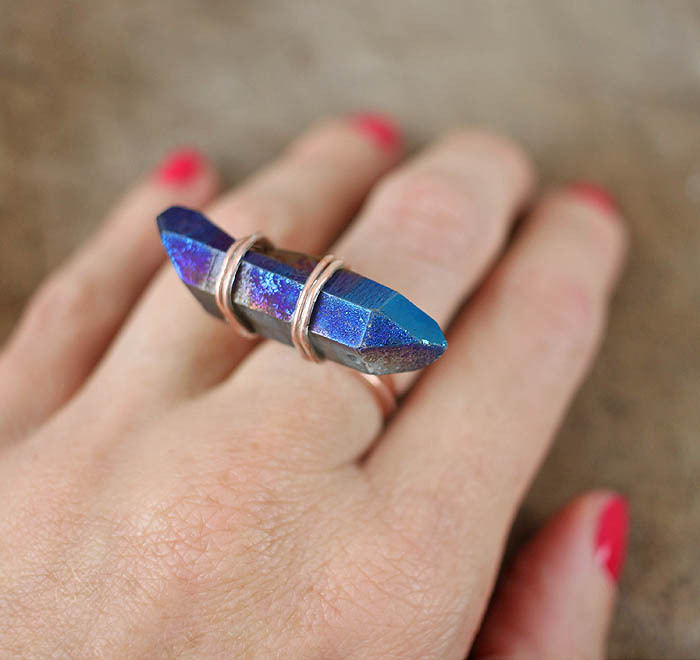 And if your taste is more bold and colorful, go for this beautiful wire wrapped crystal ring. You can use any type of crystal that you have, and then use a copper colored wire to wrap around both sides. Head on over to Gina Michele’s blog to read all about it. Here’s another type of wire wrapped ring, but with a different style than the previous one. Here, a beautiful pearl bead is the star of the show, and wire is wrapped around the ends of a thicker round piece. Make your way over to Make and Fable to check out the full tutorial. This pretty ring is made with leather from a pair of thongs, but you could pick up some gold leather at your local craft store as well. They are then braided, and elastic is added to make this ring adjustable. Head on over to Eryn With A Y to check out the tutorial. 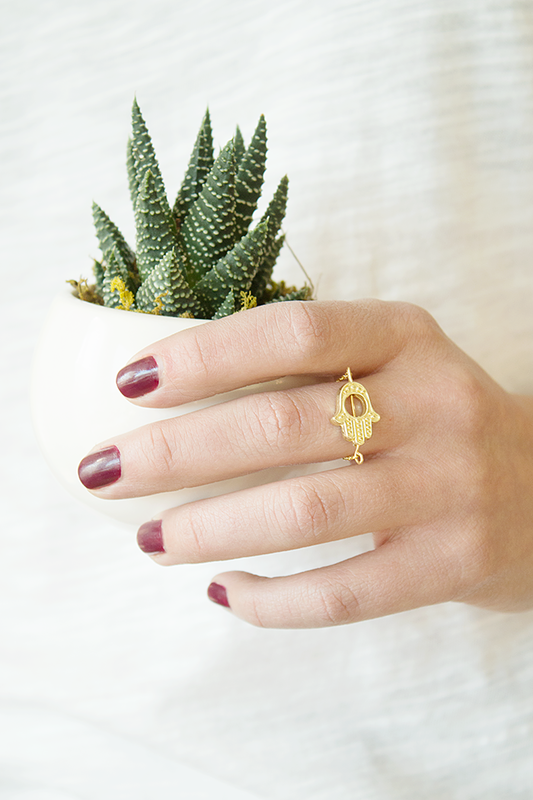 Using the popular Hamsa symbol, you can create this beautiful gold ring using a Hamsa charm and some chain. Simply slip a piece of gold wire through the charm and attach both ends to the chain. Make your way over to Adventures In Fashion to read more about it. This pretty ring is made with elastic cord, making it adjustable and also super comfortable. All you’ll need to add are some beads and a cubic zirconia. And because it is adjustable, it would make a great gift! Head over to Make & Fable to check out the how-to. 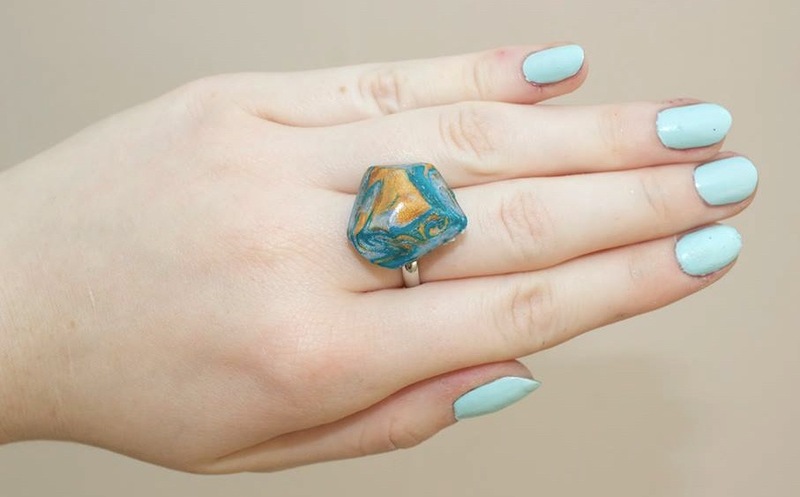 These unique rings are made with a combination of polymer clay and beads, and adhered to coins! The beautiful moon shape on the left is accented by the pretty beads that represent stars. Check out all of the instructions for this project at Gloria Fort’s blog. 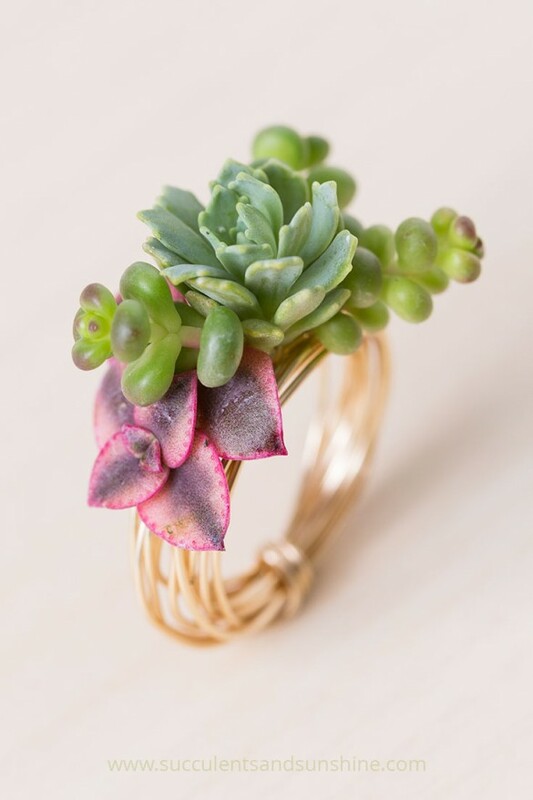 This incredible ring is very unique – it is made using actual living succulent plants! The tiny plants will obviously not live forever on a ring, but this would be perfect for a special occasion. Head on over to the Succulents and Sunshine blog to check out the directions. 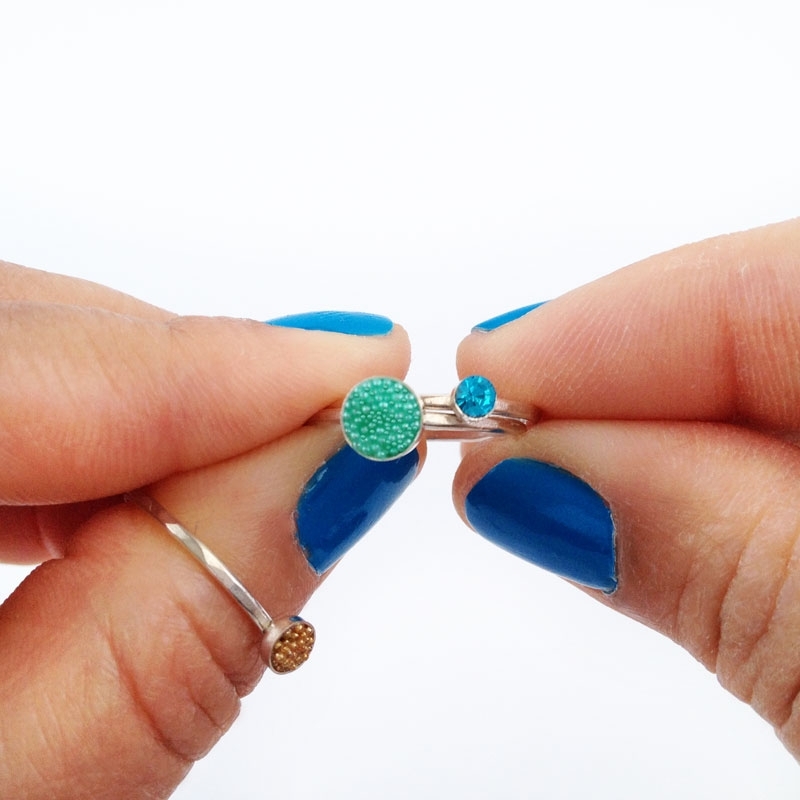 These beautifully colorful rings are made with rings blanks, and then they are filled with teeny tiny micro beads to create the unique textured look. Head on over to Mauritza Lisa’s blog to find out all the details about these fun rings that can be stacked one upon another. 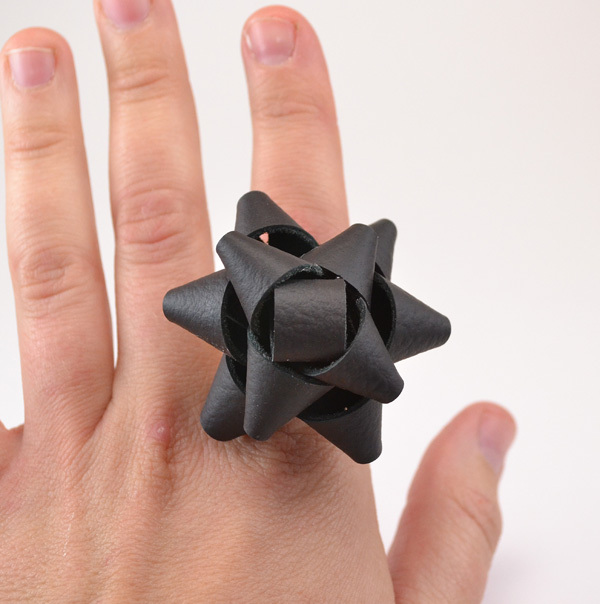 This adorable ring is reminiscent of a gift bow, but it is made with a lovely dark leather material. It is then mounted on a ring blank, and it is ready to be worn out and about during the holidays! Head over to Dream A Little Bigger to check out the tutorial. 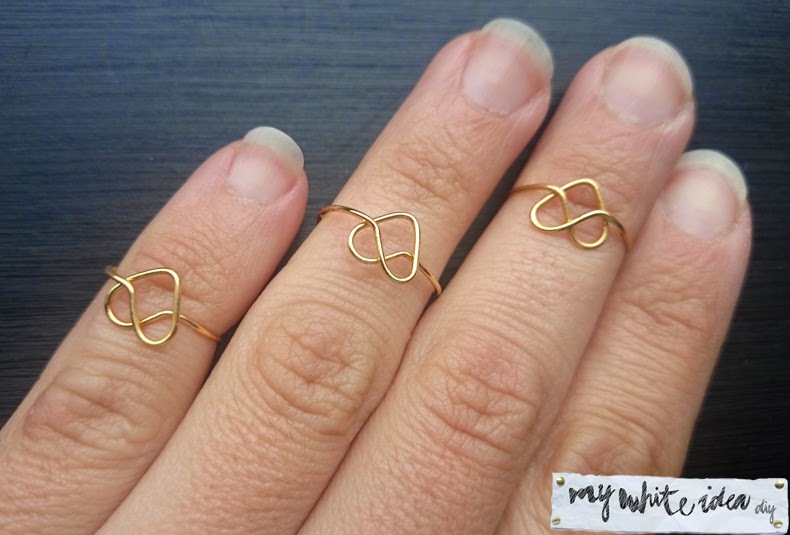 These pretty little heart rings couldn’t be any easier to make – all you’ll need is some gold wire, pliers and a marker (to wrap the rings around). These can be made with any color wire, too… wouldn’t they be cute in red for Valentine’s Day? Get the full how-to at My White Idea DIY. These fabric button rings will give your hands a fun pop of color, and you can customize them completely by using your favorite scrap of fabric that you have on hand (no pun intended!). Head over to Live It. Love It. Make It. to see the full tutorial. Although chain might not be the first thing one thinks of when making rings, it can be a very handy supply to use. Here, beads are strung on wire and then attached to chain which forms a super comfortable loop shape. Check out the directions over at The DIY Diary. 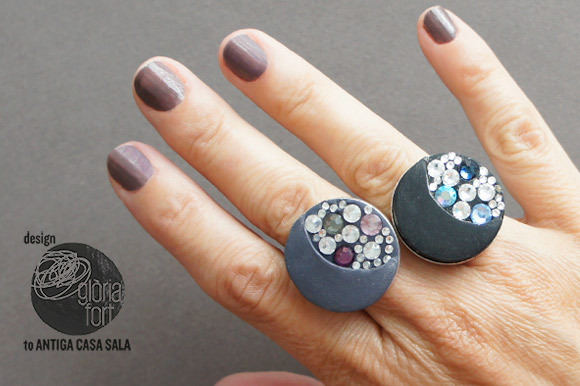 Give your fingers a more modern vibe, with these funky faux granite stacking rings. These are simple to make, using only polymer clay and a utility knife. The key is to buy a speckled clay like the one above that resembles granite. Check out the how-to here. This beautiful ring has a bit of a costume jewelry feel, while still maintaining an elegant vibe. 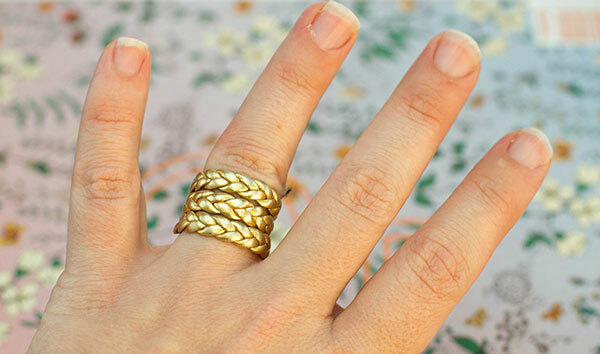 First you’ll create the hammered metal ring itself, then you’ll wrap the bling around! Make your way over to Nunn Design to check out all the instructions. 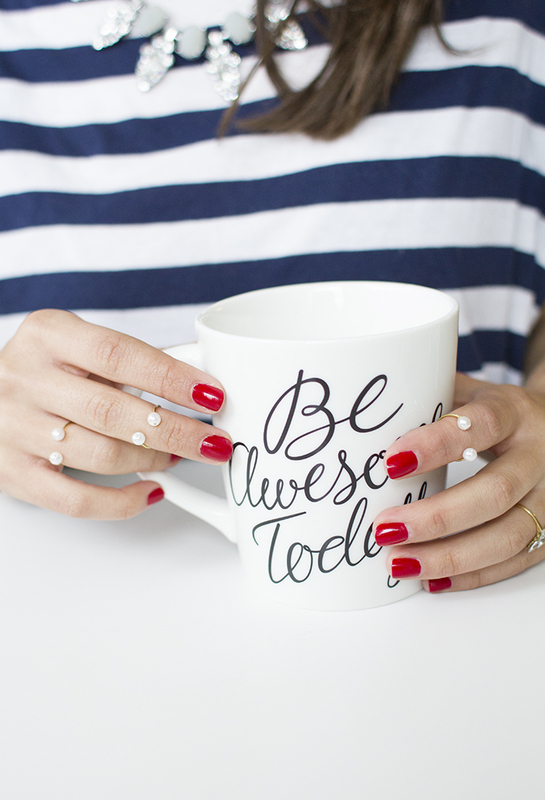 If you’re in the market for a brightly colored statement ring, then this might be the DIY for you. 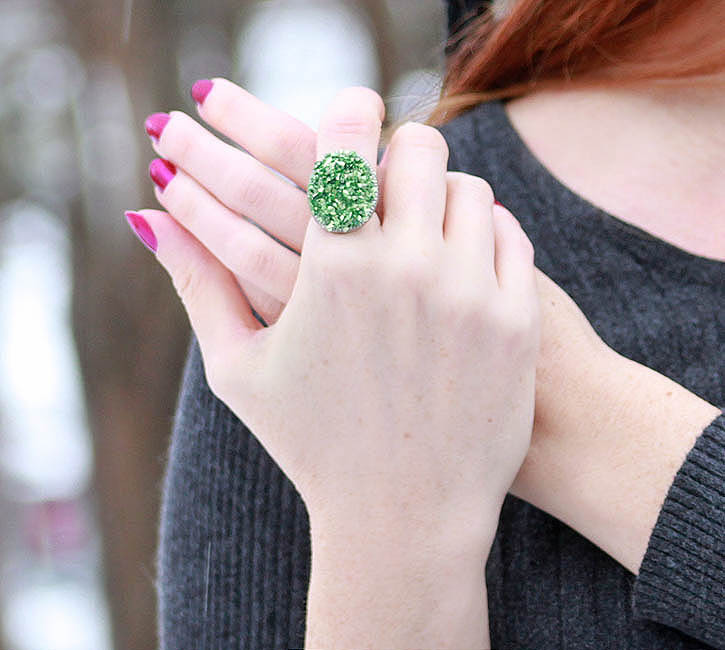 This beautiful faux druzy ring is actually made using glass glitter and Mod Podge… genius! Head on over to Gina Michele’s blog to view the full tutorial. Here’s another bold ring idea… this time it is made with clay. Simply combine a variety of polymer clay colors into a swirly pattern like the one above, and then bake it and glue it to a ring blank. Get the full photo tutorial over at the Obscene Aubergine blog. In this helpful tutorial, you will learn how to drill through a hammered ring so that you can create these beautiful rings piled with beads and metallic accents. 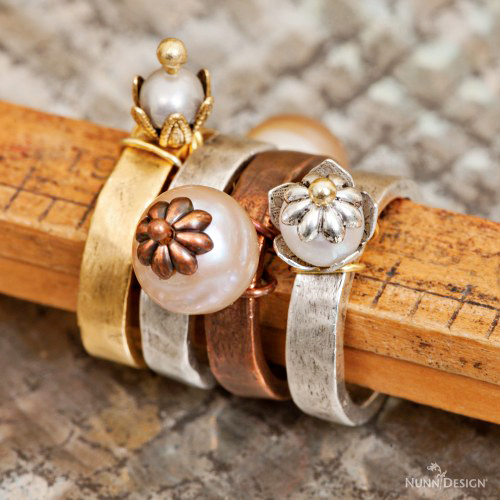 Make your way over to Nunn Design to check out the step-by-step instructions for these pretty rings. Believe it or not, this ring is actually made out of layered paper. Paper! Thirty layers of paper in a variety of colors are glued together, then they are sanded down to form the shape shown above. 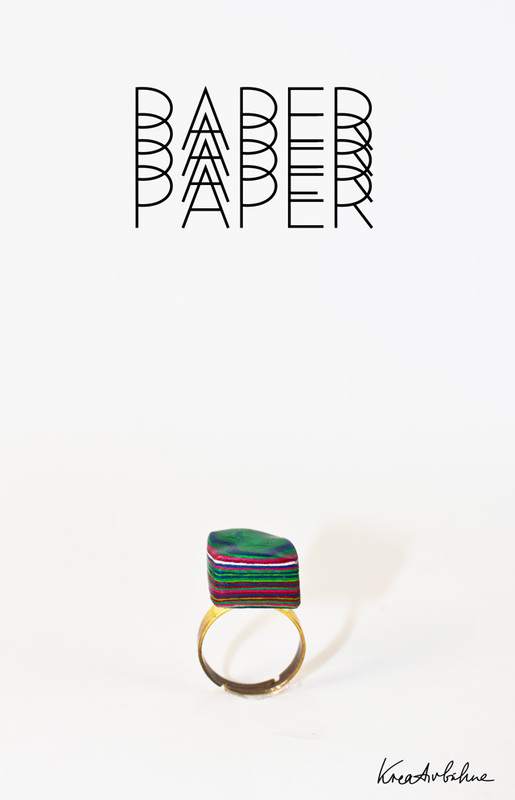 Head over to Kreativbuehne to find out how to make your own paper ring. 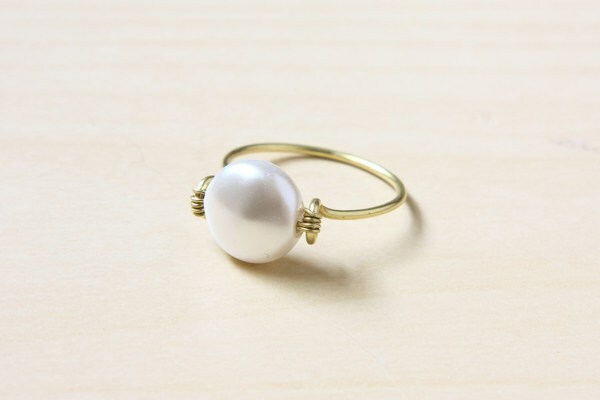 This bold ring is made with a large pearl, some wide flat wire, and some thin gauge wire to attach everything. The key is to bend the flat wire around your finger diagonally so everything lays correctly. Head on over to My White Idea DIY to check out the instructions. Throw a twist into the traditional pearl ring by turning it into a knuckle ring… which is simply placed in between the top two knuckles of your fingers. And because of the way these are made, they are adjustable. Check out all of the instructions here. 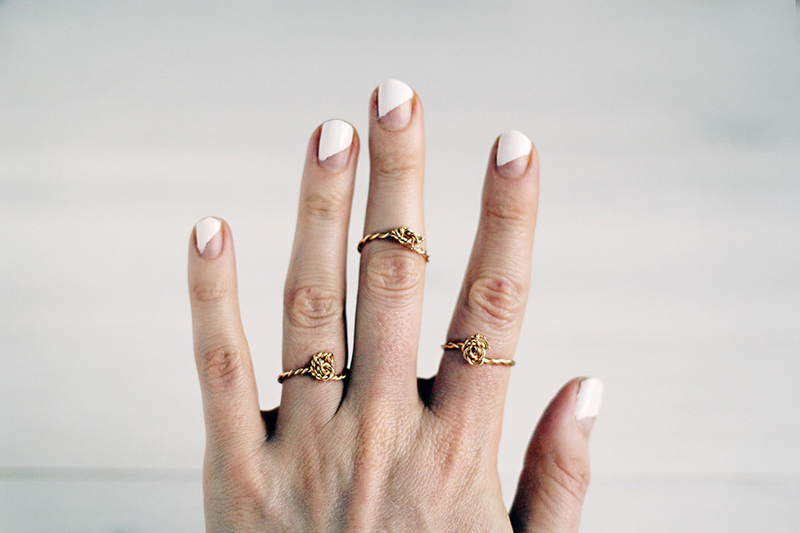 For a more delicate style, try these pretty twisted knot rings. They are made with gold or brass wire, and they are incredibly simple to make. Try making them in silver and copper too! 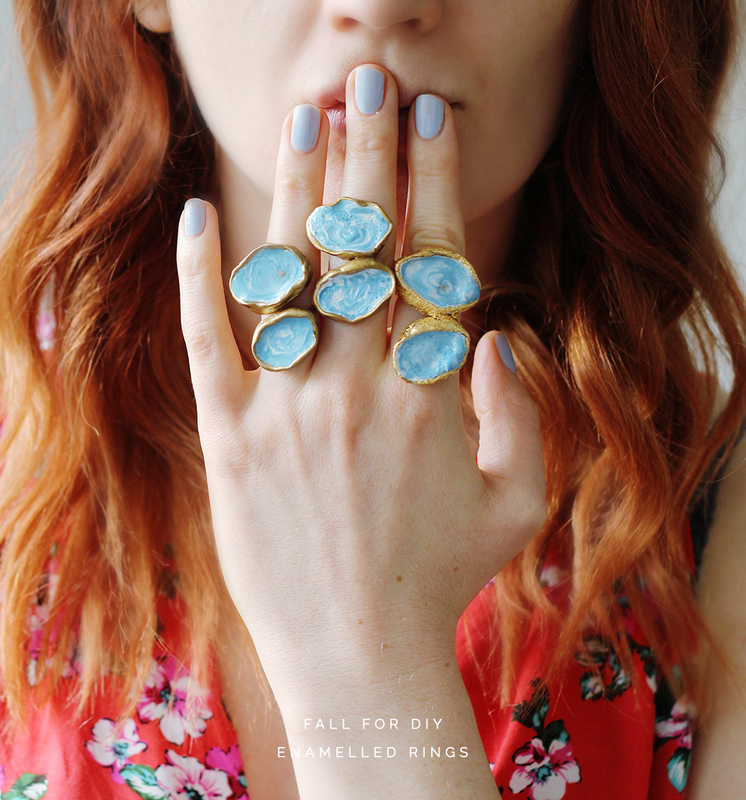 Head on over to Fall For DIY to check out the full tutorial for these rings. These incredible statement rings are meant to look as if they have been made using agate, when in fact they are created using enamel on top of clay that has been gold leafed. Make your way over here to check out the full photo tutorial for these beauties.